2N SmartGate is a single-channel analogue GSM gateway, which provides a number of services for cost efficient way of communication. It is intended for small size companies and households and its main objective is to save the users a lot on GSM call costs. 2N SmartGate can be connected to a PBX, to a standard telephone set or to PC (LAN) and can be used for Voice, Data through GPRS, SMS and PC Fax transmission. 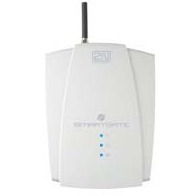 Using 2N SmartGate analogue GSM gateway you can save half of your company telephone bills since all calls directed to GSM networks are routed through 2N SmartGate and extortionate bills for the PSTN-GSM connection are avoided. A great advantage of 2N SmartGate is its DialThru function. When you connect this GSM gateway to your standard telephone set, you can call directly to the PSTN and GSM network. 2N SmartGate is equipped with both FXS and FXO interfaces. It can be installed on a PBX trunk line (FXS port), a PBX extension line (FXO). With 2N SmartGate on a PBX extension line, the new feature "Follow me" makes the user accessible any time and anywhere on the mobile phone to people who dial the user's fixed number assigned by the PBX. From now on, you do not have to worry about information on your prepaid SIM card status. You can configure the gateway to receive a "LOW CREDIT" SMS message whenever the SIM card credit gets below a pre-programmed amount, e.g. 5EUR. The GPRS connection enables e-mail communication and Internet browsing. It is often used as a back up internet connection for small offices, or primary internet connection on boats or in distant areas. SmartGate enables all LAN users to send and receive SMS with a 2N network application - the SMS server. The delivery status of any message can be obtained automatically. EnergyBank a back-up power supply that can be used with any equipment requiring 12V supply, ex. 2N SmartGate. With this product any 12V equipment can work for a substantially longer period of time without stable feed. Telephone cable, Serial cable, Supply adapter, CD with SW, GSM antennas, Input connector for SMS sending and Screws with dowels. 2N SmartGate can be installed within a few minutes and its installation requires no special technical skills.